Hello everyone! 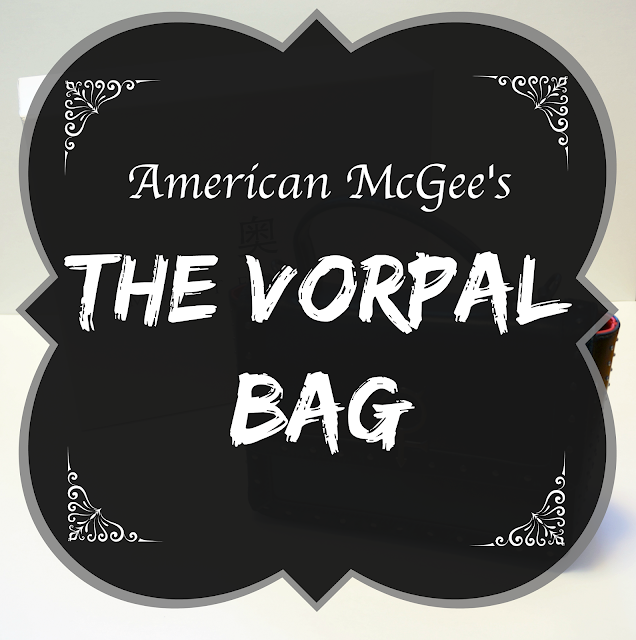 I'm back with an unboxing for American McGee's The Vorpal Bag! Originally, I wanted to do a review on this bag, but I felt that it would be a bit too biased for me to make one. I'm a big fan of American McGee's Alice Madness Returns game. So when I found out that they were releasing a bag based on the video game, I jumped on the chance to grab one for myself! 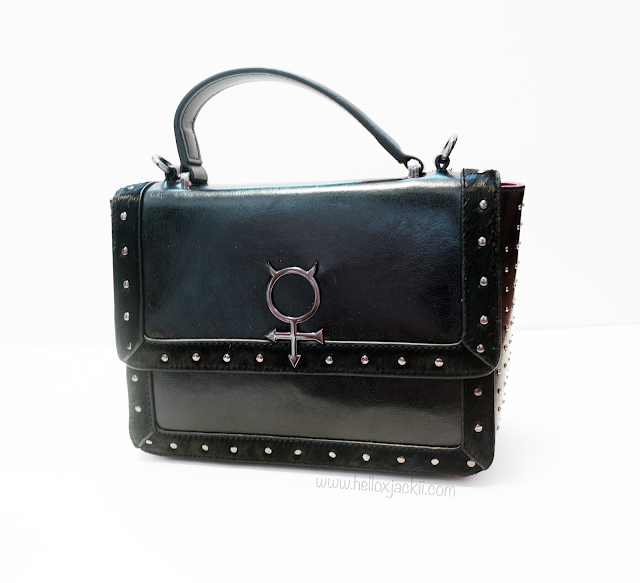 I ordered the bag using this link: http://american-mcgee.myshopify.com/products/the-vorpal-bag. A little note card was placed inside the box. 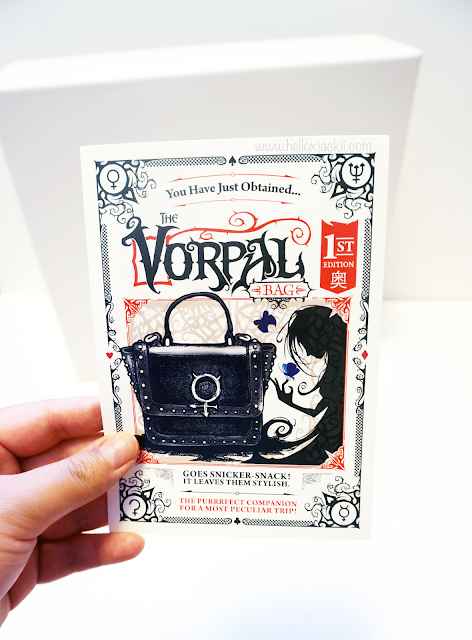 Basically, the card stated that the Vorpal bag I got was part of the 1st edition collection. I'm not sure if that means there will be other editions? Flipping the card over, it showed which number bag I got out of 200 produced. I don't exactly remember the number I got, but I think it was between the numbers 15-25. I think adding this little note card was cool! It made me feel like I was part of the original batch of bags made. Along with the notecard, there was a letter from American McGee and Yeni Zhang. It gave care instructions for the bag along with contact information for questions and concerns. 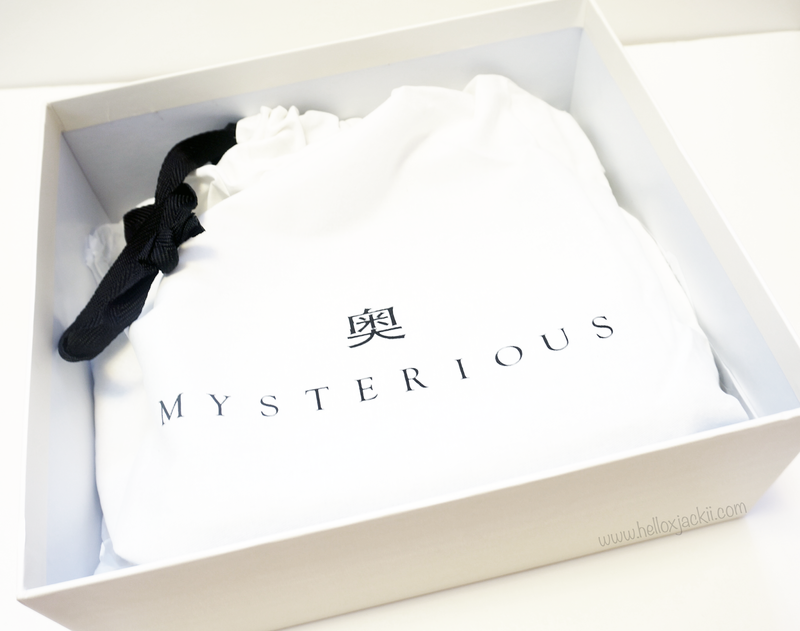 The Vorpal bag was carefully encased inside this "Mysterious" white bag. This made sure that the bag wouldn't be bumped around during delivery. Also when the Vorpal bag isn't being used, you can place it into the white bag to keep the dust away from it :)! However, I think the white bag can reused in a more practical way. Perhaps you can use it to carry your groceries or other items! This is how the bag looks like! It looks exactly like the photos on the website. First impression of the bag, it feels like real leather! Right out of the packaging, it seems like the Vorpal bag had been polished before it was shipped out. It was shiny! 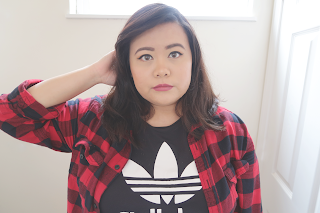 (I know it doesn't look too shiny in this photo, but it was pretty glossy.) 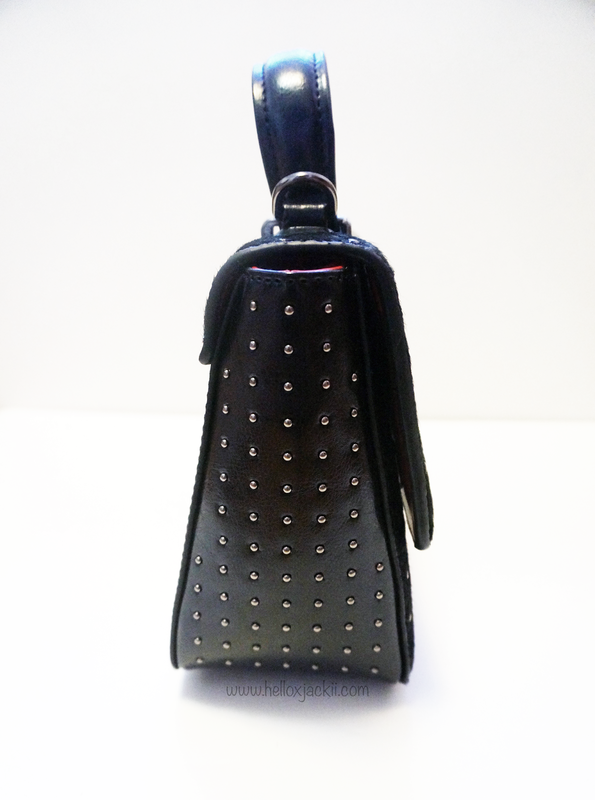 There's also black horse hair lining the outer rims of the bag! I was surprised. 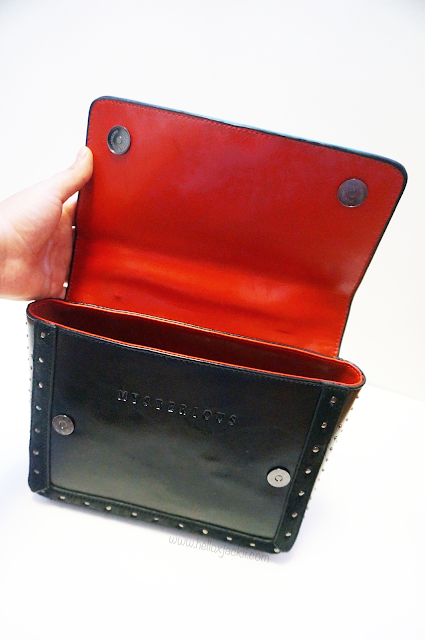 However looking back at the website it does say, "Hand constructed of fine quality leather, stainless steel, horse hair, and alchemy print bag liner..."
I like the black and red scheme! The bag is held closed by two magnetic buckles. You don't have to worry about the bag accidentally opening if you bump into something. 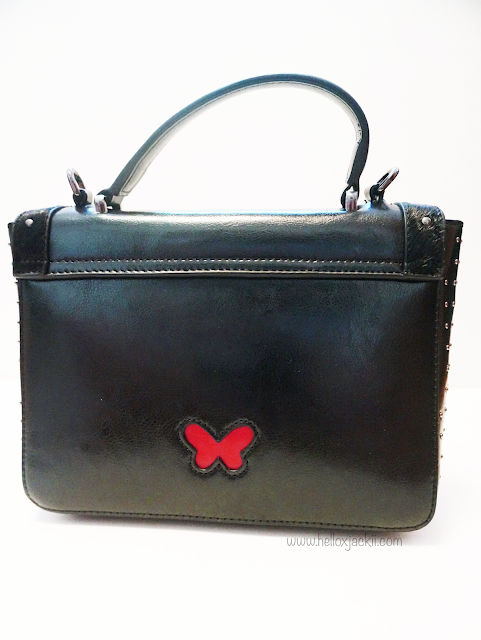 The magnetic buckles are pretty strong! I dropped the bag on accident and all of my items stayed in the bag because of the strong magnets. 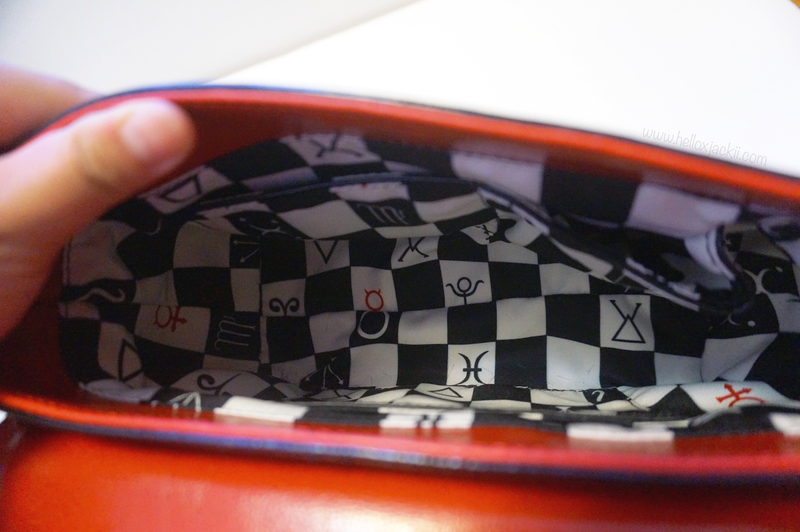 The inside of the bag has a checkered print. There was a surprising checkered pattern print inside the bag. I know this photo is a bit blurry, but there are two slots on the top side of the bag. I usually assume that's the place where people place their phone into. However, if you want more security, there is also a zippered compartment at the back side of the bag for more valuable items. Here is a back view of the back. There is a small red butterfly on the back! Looking at the back of the bag reminded me of the Alice Madness Returns game. Whenever you died in the game, you would be resurrected in a flurry of butterflies. The red color also reminds me of the famous "Hysteria Mode" where you were invincible for a brief period of time. I don't have a photo of it, but the bag comes with a leather strap. You attach the straps at the little place holders at the top of the bag. I think it's nice that it comes with a strong handle and a leather strap. It gives you more options of carrying the bag! I can't wait to use this bag on all of my adventures in my new city! This is definitely a great bag. Definitely the perfect size for traveling and looking totally cool while doing so :)! 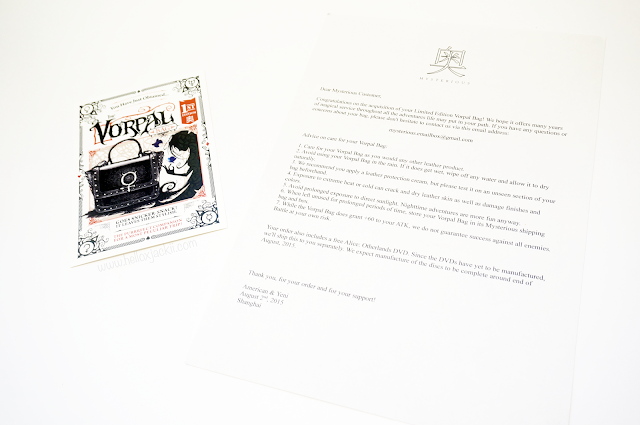 I was never really into collectible items, but I'm really glad that I got this limited edition Vorpal bag!